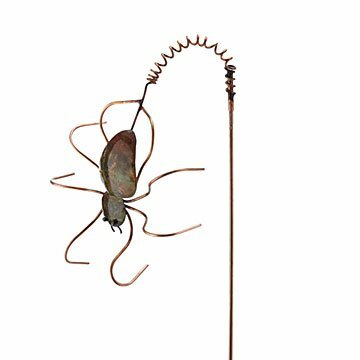 Inspired by the ultimate garden guard, Catherine Murphy handmakes this patina copper spider ornament. While you bustle during the day and drift off to dreamland at night, garden angels look over your buds and blossoms. And by angels we mean spiders: they're the ultimate yard advocate, banishing outdoor pests like flies, beetles, and aphids so flora can bloom freely. Inspired by these eight-legged overseers, Catherine Murphy handcrafted this springing spider stake. Its patina copper finish reflects light in warm rays, and delicate lines match the complex beauty of its muse. Sink the critter in or near a bed of flowers, fruits, or veggies as a whimsical good luck charm, and watch as it springs and sways in the wind. Handmade in Asheville, North Carolina. Spider: 8" H x 8.5" L; Coil: 6"; Stake: 36"
I bought this to mark the place where we buried my daughters beloved "pet" Tarantula in my flower garden. The look on my daughter's face when she saw I purchased it as her baby Dahlia's grave marker, made me glad I got it. It's very pretty and adds a nice touch among the flowers. It's perfect. Had to Get A Second One! Have many garden stake art pieces, most from Uncommon Goods. This one was so neat (and who doesn't like spiders!) had to get one for our daughter's yard for her birthday. For me, buying a second speaks volumes. Item is great. Perfect to give as a gift to add a little something extra to a garden.